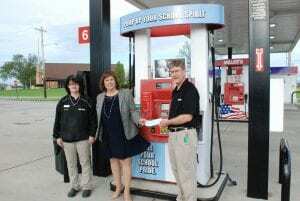 SCHOOL SPIRIT PUMP … Miller’s Gas on Whitaker Way in Montpelier recently partnered with the Montpelier Schools by donating a portion of proceeds from a designated pump to Pump Up Your School Spirit. $.02 for every charged gallon and $.05 of every cash gallon is donated to the school for various programs. Patrons are encouraged to use the marked school pump when getting gas. Shown are Miller’s employees Renee Nye and Butch Brown presenting a check for $726.98 to Su Thorp of Montpelier Schools. Be the first to comment on "Montpelier Schools Are “Pumped” with Donation"